There are two quite different visions of globalization in health care. Some people see a global market and great opportunities, and are looking at how to strategically position Canadian institutions to best take advantage of them. The hypothesis here is that globalization and the free exchange of ideas, information and goods between countries bring added value in economic terms, but also in population health as these produce a redistribution of economic advantages. This argument is based on the idea that one of the most important determinants of health is poverty and low levels of development, and that globalization can help to increase average income in different countries. Obviously, the facts do not all point in this direction. The skeptics, or non-enthusiasts, see globalization as a powerful economic forum for exchanges in which a few players predominate, and note that increases in income are accompanied by growing income inequality within and between societies. This inequality is viewed as an important determinant of health problems. As a healthcare institution wishing to benefit from globalization but also produce some good, the best idea might be to adopt a position somewhere between these two visions: to recognize the opportunities, but acknowledge the skeptics’ concerns in deciding what projects to develop and how to develop them. This brings us to another dichotomy. On the one hand we talk about globalization in health as a market: an opportunity to share knowledge and goods. On the other hand, we have a tradition called “health and development”, “international health”, or now “global health”, involving projects that promote the development of local capacity to produce health benefits. The World Health Organization’s (WHO) Global Health Initiative, for example, aims to increase health equity and produce long-term improvements in health systems and the health of populations. Reich and Takemi (Lancet 2009) analyzed G8 resolutions regarding health, and identified important changes in how these efforts are governed. Previously, the WHO exerted a form of moral leadership and governance over the global health sector, despite being unable to intervene directly within a country. Today, the transformation of the “market” in global health has seen a much more diverse, organized and structured group of players come onto the scene, from non-governmental organizations (NGOs) that have grown much more powerful or private organizations that see health as an increasingly important target. The authors emphasize that the WHO is ill equipped to pilot, orchestrate or influence what is happening in a globalized health sector populated by these new actors, which therefore creates a governance challenge. When healthcare institutions get involved in projects in Haiti or elsewhere, they are participating in this reformulation of the governance of a global health area that falls less and less under the moral and protective umbrella of the WHO. A 2011 report from the Canadian Academy of Health Sciences, Canadians Making a Difference, estimates the federal government’s investments into various global health programs at $559 million a year, and describes enormous expertise and capacity in Canada for effective and pertinent interventions in global health. However, the report notes an almost complete absence of strategy and vision to guide these interventions: we recognize opportunities, but do not have a structured network to act on them in a concerted way. At the same time, certain traditional beneficiaries of global health projects are very rapidly developing their own healthcare capacity, and are becoming more interesting as potential partners in the exploration of solutions to health problems that are increasingly similar from one country to the next. One only has to look at Brazil to see the enormous progress made in the capacity to develop health interventions and participate in global health projects. We are now at a stage when richer countries that used to be seen as the main players in global health are finding more and more countries with interesting contributions to offer as potential partners. How to pursue these new opportunities? Canadian institutions have succeeded well enough in developing partnerships that fall halfway between the healthcare market and health care as a road to development. But there again, no concerted strategy has been elaborated. The Association of Canadian Academic Health Organizations (ACAHO), in its 2011 annual report, included a small paragraph on global/international health. It underlines the importance of this area and provides some interesting numbers describing the involvement of major academic health centres at the international level. However, it says very little about how they should act internationally, about their formative initiatives, and about what partnerships exist between the different academic health centres (AHCs). An institution seeking to find a balance between the globalized market and the global health arena may aim to develop partnerships that produce innovation in these two areas. 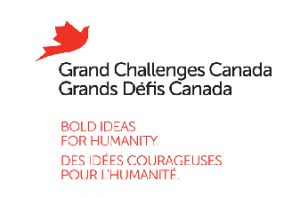 Grand Challenges Canada provides an interesting example. The organization aims to finance highly innovative applied research projects, and offers both commercialization support and development assistance to international exchanges. They refer to this approach as “integrated innovation,” and fund the coordination of new knowledge production that stands to have strong social or commercial impact. The hypothesis is that, if they are to have significant benefits, technological advances to meet current societal challenges must be accompanied by social and commercial innovations that enable them to adapt and travel across borders. This is a lesson we learned long ago in social research and development: at heart, creating innovation means working in partnership on local and regional capacities, adapting innovations and assuring local participation in their creation. If we want a greater presence on globalized health markets, we need to get a handle on what type of innovation we want to create and deploy and more important, on what kind of process we will put in place to become consequential actors in the production of collaborative and integrated innovations. We also know that past experience with collaboration between partners generates mutual trust and that this trust is an essential ingredient in the development of new partnerships. If we increase our activities in a globalized market and trust is lacking with our partners, the collaboration is unlikely to produce much benefit. We must also recognize that governing partnerships and networks is not the same as governing institutions that are under our authority and have well-defined borders; and that we have much to learn in this regard. The authors of an article published in Administrative Science Quarterly (Davis and Eisenhardt, 2011) studied collaborative innovation processes in global computing and communications companies to identify factors that enabled these partnerships to produce innovation. The challenge is to mobilize and recombine the different partners’ assets without constraining the innovation process. This challenge is of critical importance to the subject at hand. In a globalized market, we are not just taking a product made in our country and trying to spread it as broadly as possible in other markets. We are also seeking to create new products — innovations — in partnership with others who have assets that are different from our own. One of the implications of globalization is that we will need to develop new abilities to work in environments where we can find complementary capacities in terms of expertise, leadership, technology and legitimacy. 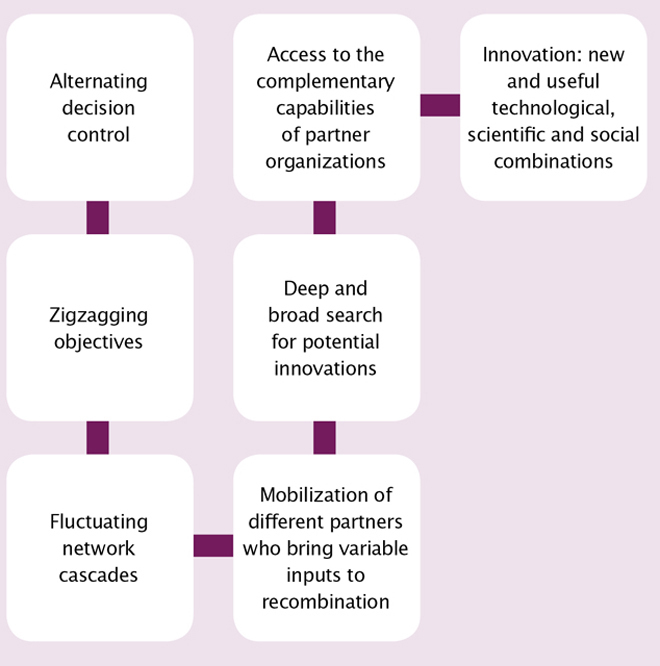 The authors find that the models for steering and governing innovation processes in many conventional strategic alliances tend to constrain innovation. They propose collaborative innovation as a way to get around this problem. Social research and research into strategic alliances in the past 30 years has found that collaborations work best when partners are able to recombine or develop assets to meet the objectives of the innovation being pursued. For example, if a Canadian organization is working in collaboration with Chinese partners in a rural region of China to establish models of primary care, the aim would be to combine the assets of each partner in order to create something new. The authors analyzed partnerships between private companies and assessed the pay-off in terms of innovation produced by these firms over a number of years in different contexts. They found that in the partnerships that produced the most innovation — whether in technological or other domains — the decision control alternated between partners. The partner who initiated the project did not hold onto the main levers of control throughout the project. Rather, governance rotated between the different partners. In the fictional example of the development of primary care for rural regions in China, the Canadian partners might start off the project by providing an initial design. But once it came time to look at how different ideas could be used to configure primary care for the particular context, Chinese partners would assume leadership. Later, when the project involved developing telemedicine capacity, the Canadian partner might once again take on the leadership role. This is quite different from the more common model that promotes close collaboration and adaptation when partnering on the global market, but where the partner that initiates the project remains in a leadership position throughout. The authors found that partnerships founded on constant consensus, where everyone gets together to decide each stage of the project, produced less innovation than models where leadership alternated between partners. This alternating control entails a reframing or reformulation of project objectives. In the example of developing primary care in rural China, it is possible that when leadership passes into the hand of Chinese partners, they identify a goal of developing capacity through training in a particular region as essential, even though it did not figure in the original project design. This study shows that the more partners have an opportunity to change or reframe project objectives, the wider the range of capacities and partners mobilized and the greater the production of collaborative innovations. The authors call this “zigzagging objectives.” In this type of model, we cannot initially define the project contours very precisely. It is an operational model founded on flexibility. In a more conventional mode of operation, access to distributed capacities is limited and partners will remain hesitant about sharing their knowledge, ideas and technologies if they do not anticipate ever gaining control over decision-making. The authors maintain that a very flexible adaptation of innovation objectives along the way (produced by rotating leadership) permits ongoing development of research and innovation processes. One of the intermediate consequences is that the networks expand according to the needs of the project. The implications for partners in global health and in globalized health markets are clear. It takes a shared but also rotating collective leadership for partnerships in a globalized arena to produce collaborative innovations. This type of leadership sustains the motivation and willingness of partners to share the assets they have available. Changes and reformulations of objectives result from the alternation of control at certain critical moments in the project. Call it a hyperflexible project management situation. Flexible objectives encourage research and exploration, consideration of new hypotheses, new organizational models, new technologies and new assets, and stimulate the activation of large and varied networks (see Figure 1). This vision is quite different from the one that guides the global health partnerships we know today. In the June 2012 edition of the Harvard Business Review, Steve Thompson, who leads Johns Hopkins International Health (an immense, organized and productive enterprise), offered his advice in the form of a check list for risk management in international partnerships. We note very quickly, in this model, that Johns Hopkins is the project initiator and retains control of the project all the way through. They co-opt local actors strategically, but consider themselves the project leaders. According to my interpretation of the article, this dominant model of doing business in a globalized healthcare market contrasts with the model needed for collaborative innovation and the processes required for its production. Would all our international projects benefit from a collaborative innovation approach? In technological partnerships that are tightly circumscribed, a contract for the purchase of services should suffice. But if the goal is to work together to develop innovations to intervene more effectively in global health and meet the shared challenges that present on a globalized health market, the contract should include management processes that encourage collaborative innovation. Jean-Louis Denis, PhD, FCAHS, MRSC, holds the Canada research chair (tier I) on Health System Design and Adaptation. He is Senior Scientist, Health System and Innovation at the Research Center of the CHUM (CRCHUM), and Visiting Professor, Department of Management, King’s College London. His current research looks at integration of care and services, health care reforms and health system transformation, medical compensation, professional leadership and clinical governance. He is a faculty member of the Canadian Foundation for Healthcare Improvement. In recognition of his academic contribution to the field of health policy and management, he was nominated a member of the Academy of Social Sciences of the Royal Society of Canada in 2002 and fellow of the Canadian Academy of Health Sciences in 2009. Recent papers have been published in Journal of Health Politics, Policy and Law, Organization Science, Academy of Management Annals, Milbank Quarterly, Administration and Society, Implementation Science and Journal of Public Administration Research and Theory. Since 2016, he has been co-editor of The Palgrave Organizational Behaviour in Healthcare monograph series.